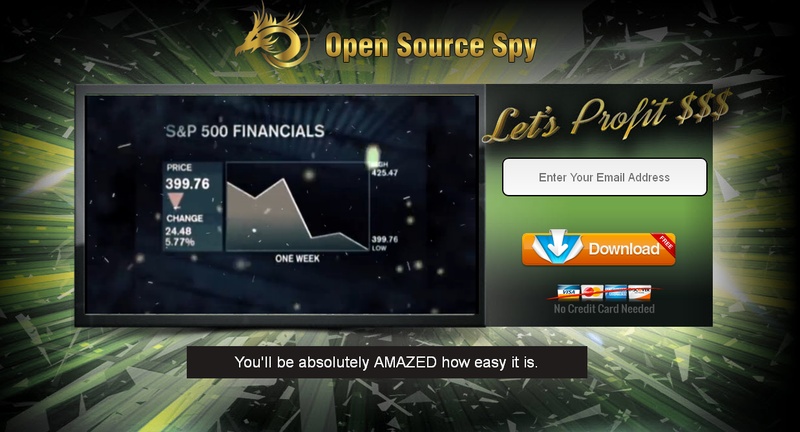 Open Source Spy Review – Scam System? Welcome to my review of the Open Source Spy system. The website for this system claims that it’s going to allow us to earn $1,076 per day on complete auto-pilot with absolutely no experience at all… To me that just sounds all too good to be true so I’ve decided to take a deeper look to find out just what exactly it’s all about. The even more shocking thing about this system is that it claims to be totally free. Yep, that’s right – a system that claims it can make us $1,076 per day is supposedly being offered completely free… There’s got to be some catch right? After just watching a brief few seconds of the video it quickly becomes clear that this is nothing more than another “free” binary options system. Those of you who trade binary options will probably know that these systems have developed a really bad reputation & are best avoided. For those of you who didn’t know that, you do now. You see these so called “free” binary options systems aren’t as free as they make out at all. Despite the homepage claiming “No credit card needed” after entering your email address into the form it’ll quickly become clear that in order to actually gain access to the system you’ll need to make a deposit of around at least $250 with the broker they recommend. I don’t know about you but that’s not what I call free. So you might be thinking “oh but that’s just my deposit with the broker, the system is going to make me that back, and more”… wrong! I’ve seen literally hundreds of these systems & I’ve yet to see a single one put somebody into profit. Basically when you deposit with the broker the creators of the system earn a commission, 9 times out of 10 these systems are nothing but pure hype to try & convince you to deposit funds so that they can earn themselves some money. After you’ve deposited your cash you’re left to find out the hard way that the system doesn’t work as promised. For that reason I very strongly recommend that you avoid these systems as they’re only going to do one thing, and that’s part you with your hard earned cash. To be honest binary option trading in general is pretty risky business and I’ve seen very few people who actually make a profit. In my eyes binary option trading is nothing more than a dolled up form of gambling. Think about it, if there was that much skill involved & it was so easy then professional hedge fund managers would be trading binary, yet they don’t. Why? Because it’s not easy! If you really want to trade then I’d recommend getting into Forex trading or learning about the stock exchange & trading there instead. Remember, trading should be kept for fun & if you’re trying to build an income from trading then you should quit – it won’t happen! At least not without losing an awful lot first. If you’re truly looking to build an income online then I’d recommend looking into online marketing instead, that’s how most people make money online & believe it or not it’s actually pretty easy to get into. When the internet first came about you had to be up there with the “elite” tech-savvy marketers in order to make money, but nowadays there’s so many proven systems out there that it’s actually become pretty easy for just about anybody to plug in & begin profiting. So does this system work? No, it doesn’t. If you’re considering depositing with this system, don’t (that is unless you’re looking for the quickest way to lose your money). Free binary options systems should be avoided at all costs. As I mentioned above I’ve seen literally hundreds of these types of systems & I’ve yet to see a single person fall into profit. Everybody I’ve seen deposit into these systems has lost their money. These systems just try their best to get you all hyped up in order to convince you to make a deposit so that the creators can earn a big fat commission. Once you’ve deposited they no longer care because by then they’ve already made their money & then you’re left to find out the hard way that the system just doesn’t work as promised. They are literally nothing but hype. Avoid, avoid, avoid… Unless you’re looking to lose money! Forget binary options, forget about trading, start looking into online marketing & start learning a skill that will allow you to build a real income online. I hope you appreciated my review and more importantly I hope it prevented you from losing your cash to this system. I’d love to hear your thoughts so if you could take a minute to leave a comment below this post then I’d be really grateful – thank you! Team Mansell System Review – Scam or Legit Way To Make Good Money? Your Profit Team – Scam Biz or Legit System? My Review Uncovers Everything!